Our range of Double Sided Poster Pad’s allow for an effortless application onto your product and also provide the ability to be applied to a number of surface. Our Poster Pads will provide an excellent cosmetic look and will erase the need for any “Hammer & Nails” We offer a wide range of pads to suit your application, from removable and reusable to high performance permanent pads. They leave no adhesive residue and are ideal for lightweight signs, posters, point of sale displays. Great for any temporary application where clean removal is very important. Our Clear permanent pads are perfect for applications when you require an instant, long term bond, indoor and outdoor. 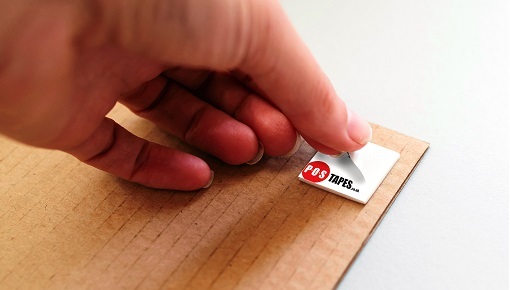 This unique product features a removable adhesive on the closed side and a permanent one on the open side. Ideal for when clean peel is required on a specific surface. Our High Grade, Double Sided foam Poster Pads provide a permanent bond with its Modified Acrylic Adhesive System, ideal for a wide range of surfaces from Foamex to glass and for indoor and outdoor use. The Scrim re-enforcement adds dimensional stability to this highly aggressive adhesive, without losing any of the products conform-ability. It is therefore an ideal solution for lamination, fixing and mounting of structures, rough or textured surfaced substrates, where dimensional stability is required to eliminate stretching during final application. This product is highly resistant to environmental elements and therefore can be used outside without the adhesive, hardening, degrading or yellowing. This is even after prolonged exposure to UV in situ. As with all our adhesives the Scrim Tape is solvent free and produced without migratory chemicals, ensuring that the mass is free of acids and out gassing chemicals. (compatibility with delicate surfaces should always be tested by the customer prior to use).